Lenovo-owned Motorola is widely speculated to launch its next-gen Moto G7 smartphones as early as in February in Brazil. In the meantime, the brand’s next iteration of Z-series smartphone — allegedly dubbed as Moto Z4 Play — has popped-up on the internet. Courtesy of OnLeaks and CompareRaja, Moto’s mid-range handset has been leaked in early CAD-based renders. The renders give us the first look of the device that is expected to make its debut in the first half of 2019. 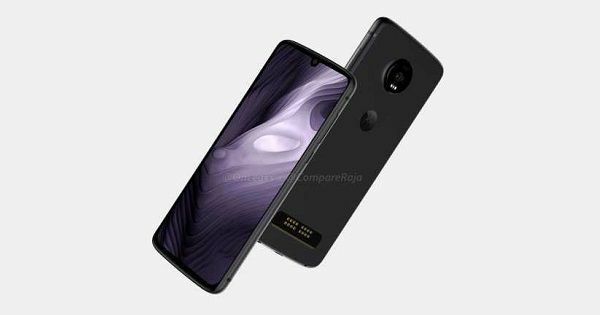 As can be seen in the image (above), the Moto Z4 Play ships with a design that looks reminiscent to its predecessor Moto Z3 Play. The only notable difference one can point out is the edge-to-edge screen and a waterdrop-style notch up top. The tiny cut-out houses selfie camera. The similar notch is also expected to come to the Moto G7 and Moto G7 Plus smartphones as well. The report further reveals that the Moto Z4 Play could sport a 6.2-inch display. From the rear-end, the device can be seen flaunting a single rear camera and LED flash inside the circular module that juts out from the frame slightly. It seems strange since the Moto Z3 Play came with a dual-rear camera setup. Motorola might offer a bump on the primary sensor to make the Moto Z4 Play a photography beast. The handset is also tipped to feature a Moto batwing-like logo at the middle and magnetic strip to support Moto Mods. The Moto Z4 Play will reportedly be compatible with all the Moto Mods introduced so far, including the latest 5G one. Apart from this, the phone is likely to come with a 3.5mm headphone jack and micro USB Type C port at the bottom edge. The device will roughly measure 158 x 75 x 7.25mm, and it’s expected to come with an in-display fingerprint sensor. Coming to the specifications of the Moto Z4 Play, they are vague at the moment. However, considering what its predecessor got, we expect either Snapdragon 660 or Snapdragon 710 SoC ticking at its core, accompanied by up to 6GB of RAM and 128GB expandable storage. It’ll most likely be a stock-Android offering, and considering Motorola’s history, the Moto Z4 Play could boot the latest Android 9 Pie out of the box.